High quality rigid water fed poles designed for professional window cleaners. Available in sizes from 18ft to 72ft. The Evolution Poles come in four different poles types (Glass Fibre, Carbon Composite, Carbon Fibre & High Modulus Carbon Fibre), and our range has sizes from 4ft up to 72 ft. 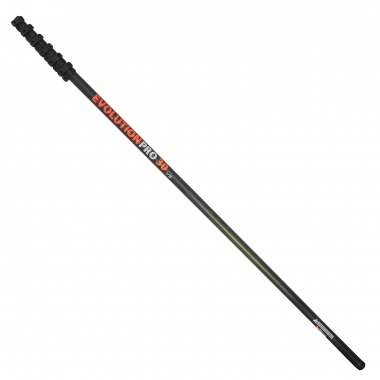 These poles are lightweight durable and unbeatable value for money. Easily extend your water fed pole as and when requried. 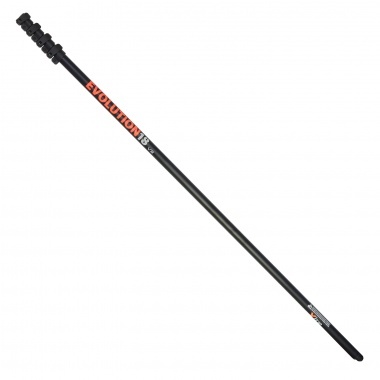 Simply use 1 main water fed pole for daily use, and easily add on extension sections as and when required. Possibilities to extend your 20ft Evolution pole to over 60ft reach, each extension section is 6ft in length. Need to reach that akward window, or next floor? It only takes a matter of seconds to slide each extension section onto your pole and extends the working pole height by 6ft every time. 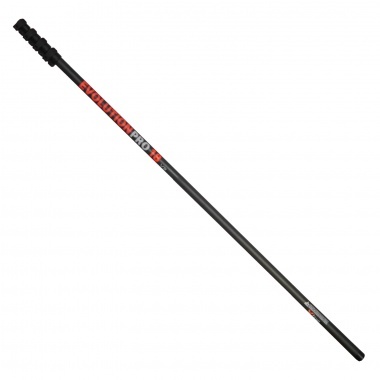 Manufactured to sit flush against the side of the pole section, with a groove for the pole hose to exit from the side, instead of getting trapped and damaged. Specifically manufactured from a soft nylon material in order to be lightweight & durable. Will also not scratch/damage any objects around you (such as a customers car). In order not to constantly trap your pole hose between the ground and pole (causing damage), we have designed this base cap so the pole hose exits from the side for maximum protection. 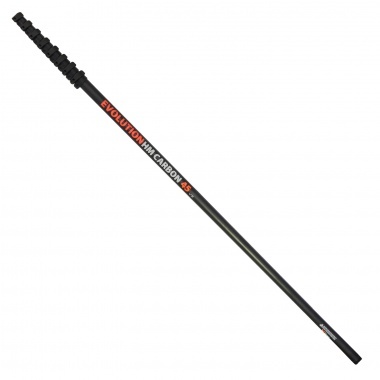 Now you have the option of extending your pole with one of our 6ft extension sections without having to remove the base cap. Fed up with clamps that easily snap, or spin? Our clamps have been designed to be hard wearing, with lots of room for tightening them over time, with the added benefit of being able to quickly replace a clamp with no-fuss. Looking for a clamp that is easy to use, in all conditions even when wearing gloves? Opening and closing these clamps is effortless, can be used with right or left handed operators & won't get snagged on objects during use. Ever snapped a clamp and been without your pole while you clean and re-glue on a new clamps? Our Evolution clamp can be replaced in a matter of seconds, so no sawing, glueing or grinding required, allowing you to get back to work sooner with a lot less down time. 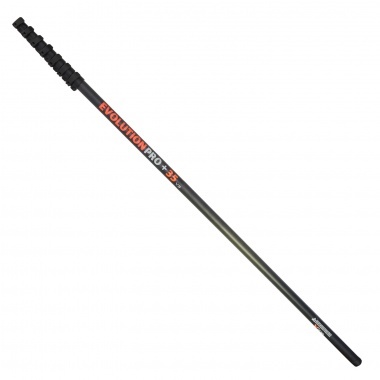 Want to quickly and easily change over brush-heads & goosenecks on your pole? Then our 0-Clamp is the perfect solution. 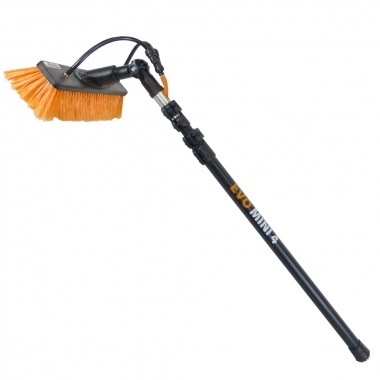 Allows you to interchange from a standard angle adaptor to gooseneck in a matter of seconds. Our 0-Clamp enables you to simply unclamp your current brush head, pull it off and insert a new attachment (brush or gooseneck) and simply clamp back down again. If you need to swap over different brush heads often, its worth utilising a quick release fitting so you can quickly re-connect your pole hose back up again, so no more fiddling about threading hose up and down your pole every time. 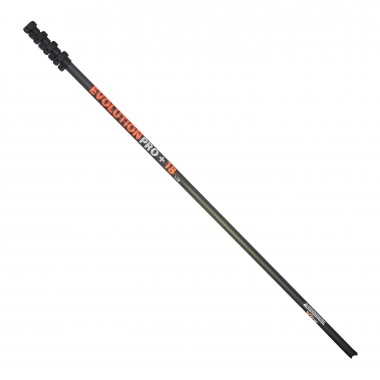 Every extendable section on our Evolution poles now come with weaved markings on the end of each section, these act as a warning to let you know you are getting towards the end of each section. We have also added in a positive end stop on each section. In the past sections markings used to wear off over time, so you had no way of knowing if you had over extended the section, which would then put excess pressure on the clamp. Now with the coloured markings weaved into the actual material it guarentees they will not wear off over time. 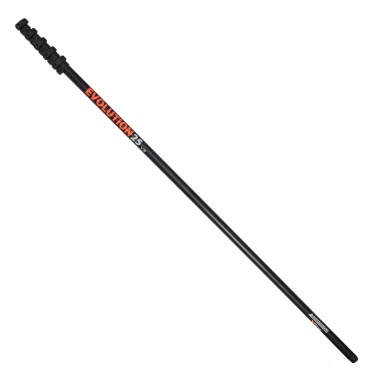 When extending one of our Evolution Poles you will notice each section stops when they are fully extended, this means you will not be in a situation where your pole seperates into 2 as you are extending it (which normally means one half of the pole will end up falling to the floor). Our premium range of Microflex Hose (available in 5mm or 8mm) is designed and manufactured to be used daily in all weather conditions without kinking. Fed up with your pole hose kinking up all the time, bursting/bubbling and not lasting very long? As window cleaners ourselves we found the same, which is why we worked closely with the UK's leading hose manufacturer in order to make a high quality hose purpose made for the window cleaning industry. Use a Hot Water System? Our 5mm Microflex hose will work with water temperatures up to 75 degrees, and will not burst or bubble up when in use. Flexible with very little memory, this hose is a pleasure to work with and should easily outlast other types of hose available on the market.